The diagram below shows the complete cooling circuit with all the main component as well the phase of the refrigerant in each stage of the circuit. A DX unit is mostly located near by the air handling unit to avoid long refrigerant pipe through the ship. The cooling coil inside the air handling unit operates as evaporator of the cooling plant. Chiled water units are used for ships where there is a long distance between the air handling unit and the cooling plant or with several air handling units. The chilled water (mostly with a percentage of glycol) will be used as cooling medium between the evaporator and the cooling coil inside the air handling unit. An advantage of this system is that it avoids the long refrigerant pipes filled with Freon on board. The compressor is a mechanical device that increase the pressure of the refrigerant gas by reducing the volume. A condenser is a heat exchanger that extract the heat of the compressed refrigerant by transferring it to a cooling medium (air/ water). In the condenser the refrigerant transforms from its vapor to its liquid state. The expansion valve removes pressure from the liquid refrigerant to allow expansion (change the state from liquid to a vapor) in the evaporator. The liquid refrigerant under high pressure entering the expansion valve is warm, the liquid refrigerant leaving the expansion valve is quite cold. An evaporator is used to vaporize liquid into its vapor state. It is one of the main components in an air conditioning system. 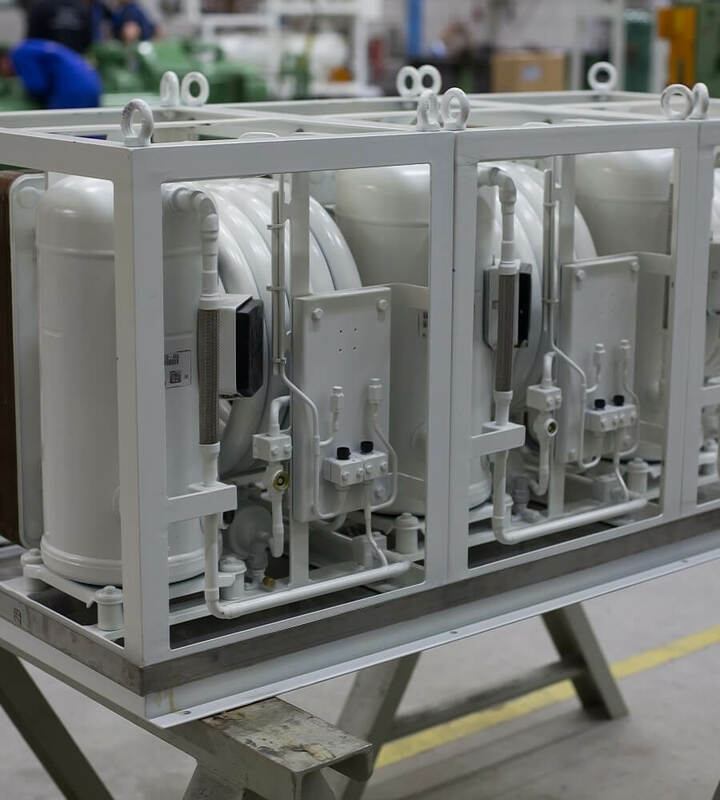 The evaporator is used as heat exchanger to allow a compressed refrigerant to evaporate from liquid to gas while absorbing the heat from the surroundings and transfer its cooling capacity to the surrounding medium (air or water). Don’t hesitate to contact us for more information about our cooling plants. We are eager to explain the possibilities for your vessel or structure. Download the Cooling Plant brochure for detailed information and technical specifications.